The dog training industry is split with two extremes…in desperate need of change! 1> On one extreme you have the “positive” only folks who are so vehemently concerned that no one ever dare disagree with their own dog or any dog on the entire planet. This group tends to treat dogs like human babies. Not like human kids or teens but like hungry human babies. They operate as if our dogs are not intelligent enough to understand they should not perform certain rude or other “bad” social behaviors. They act as if dogs can do no wrong. We have learned from this fanatical group, and heard the insane true life stories from countless clients (before they found us when they tried other trainers/behaviorists) …in my daily experience of owning and running a very successful dog behavioral rehabilitation and training business we average 6-7 appointments a day…that they (the positive only crowd) seldom get great results because their techniques use bribery and rewards only. And they bribe very early on with puppies. They stuff treats down their throats so often that they eventually kill or greatly diminish the motivation altogether! These trainers which can be found anywhere and everywhere treat their dogs (an ultra-domesticated animal) almost like some wild animal that needs to be bribed to do frivolous tricks. I always found it strange that Bribery in our human society is a crime but constantly “paying” and bribing our dogs is touted by many of these “positive only” trainers as the end-all-be-all in training. These folks, instead of bribing, could give our domestic dogs more credit and understanding as the highly intelligent and communicative species they are. But they don’t. I have to ask why would anyone of sound mind and body would, at the start, limit themselves to one rigid form only? This takes away all flexibility and adaptability in their methods! The “positive-only” crowd lacks the freedom or doesn’t seem to be aware of the fact that as a human dog owner one could choose to be “all inclusive!” This means you can play, you can be serious, you can discipline, you can praise or reward, you can calm and or pump up the energy, you can control the dog or, if the dog is trust worthy, you can turn over control to the dog and give loads of freedom. But because they are not “all inclusive” like all good parents should be they lack adaptability. Let me be clear – There is nothing wrong with rewarding for a good behavior but these “positive only” trainers/behaviorists take such an extreme approach to constant food rewarding, petting, and high pitched praise that it typically results in too much excitement from the dog or puppy which then leads to more behavioral issues in the future! 2> The other common extreme seen in the dog training industry are on the opposite end of the spectrum…the trainers who have been former military or police dog handlers/K-9 trainers. These kind are easy to identify because they will typically cling to their tools and techniques with similar vigor as the positive only crew detailed above but the tools these trainers use are usually almost all “corrective” and punitive in nature. I mean to say the tools will be electronic shock collars, prong or pinch collars, or the classic choke chain. These trainers usually will get better results initially with the dogs than the “positive only” folk because dogs will respond to a more physical approach, however, the main fault here is that these types of methods can ruin many good dogs because they are using techniques from their police or military background on common house dogs that are usually not as high drive or simply not bred as tough as the dogs they learned on in the police or military all those years ago when the trainer was serving overseas or in the community. We have some local trainers in the city where we live and train that were former military or police dog trainers and we have had clients that have taken a course from them… initially (before finding us) or done private sessions with them and they all recount tales of hanging, choking, rolling, shocking, and even something akin to water-boarding their puppy if their pup were to dig a hole in the yard! These methods are Completely overboard and sometimes borderline abusive! It is one thing to have to occasionally strongly correct with a leash pop or strong tug on the leash an active working (in the police or military) dog that is worked up and on the bite sleeve or a powerful dog that is attempting to bite another dog or person. It is quite another thing to apply these methods on a puppy or dog that will live out it’s life calmly in a city or suburban neighborhood Never going on tours in Afghanistan or Iraq or to patrol gang-town Chicago or LA! So again flexibility and adaptation are lacking in these rigid methods. The thinking with these trainers goes something like this, “You have to show the dog who is Alpha…” And while I actually agree that an owner should show their dog who is Alpha I disagree in how they and most people define the Alpha! A true Alpha dog is nothing more than a patient, peace-keeping, parent. This may be Shocking info – I know! The Alpha dog is NOT the dog who is at the park trying to knock over other dogs down or trying to fight with many other dogs. That is a common misconception. The Alphas are natural peace-keepers who stay calm and attempt to get along with every dog they meet. They know when to ignore or when to address with a firm but calming canine communication. We should all strive to study and learn from them. I have seen several over the years and it is fascinating to watch them in a large group of dogs. The Alphas actually help the humans keep the peace in a large group! They are masterful communicators. Calm, confident, competent. This female is automatically alpha to all her little pups. Alpha means parent not bully. She will raise them utilizing ignoring, addressing, and occasionally redirecting through play. A word on correcting or addressing a problematic dog: The most effective corrections I have personally used over the many years have been the ones where I don’t lay a finger on the dog but where I outmaneuver them, claim them, calm them, and then smoothly offer them more freedom! THAT is the way of a true Alpha. That is what good, loving leadership calls for – boundaries and certain disciplines within the relationship that actually lead to greater FREEDOMS! We need to lead to greater freedom NOT more rigid obedience for our dogs. Calmness mixed with efficient movement are keys to a calm and healthy puppy or dog. Anyway the point of this post is WE ALL Need to come together as a dog training community and not have these two ridiculous yet oh so common extremes. The need for calmness in humans and dogs is at an all time high in society! People actually need to learn patience more than most of our dogs do! If you are ever seeking professional help from a trainer, behaviorist, or whisperer…I would highly, highly recommend avoiding these two extreme groups. Maybe you Free yourself enough to glean the best from both worlds and then find a better balance? But, as I always say, attempt to learn more from the actual social dogs and less from the professional human trainer/behaviorist! Look to all of nature for a guideline and watch how the older (SOCIAL) dogs move and act around others that are hyper and young or just unsocial. Take their techniques and add them to your own bag! The wild thing is is that you may not be able to find a great trainer where you are at because Training itself and Behavior modification is now waaaaaay behind the times even the trainers who utilize the word “modern” in their names or methods are typically just positive-only types). The issue is that both of the above mentioned methods are much to dependent on external motivation and the use of excitement and their tools. And to go even deeper …The real heart of the issue is that the dog industry is still doing what it’s always done. Everyone thinks training/behavior mod. is the answer. My books will clearly explain why it’s not! It’s time for an exciting new future. Relationship with clear communication is the answer to preventing or reversing behavioral issues – it is the answer for a great life shared with others! I’ll admit this one was hastily written but I believe it is loaded with truth and some interesting thoughts or questions for everyone to think about and hopefully act on. 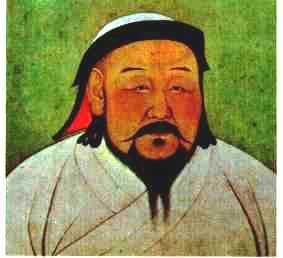 In the 13th century the Mongol emperor Kublai Khan owned 5000 Mastiffs. He used them for hunting and war. We’ve all heard about the “crazy cat lady” who hoards and “rescues” every cat near and far but Kublai clearly had her beat with his 5000 dogs! 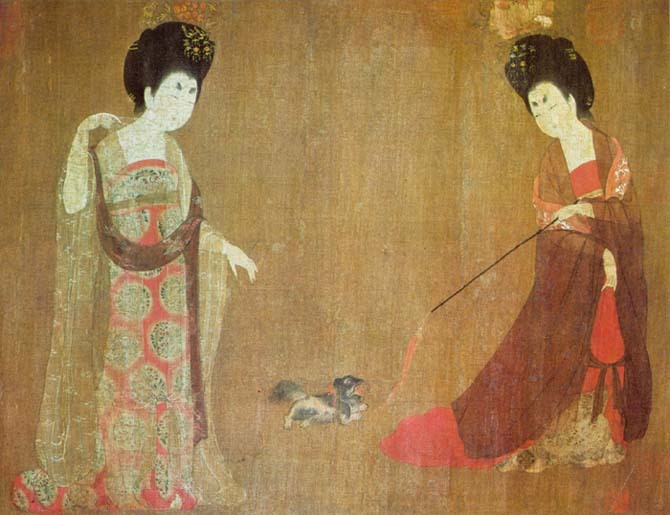 Many believe this was the most dogs ever owned by one person. That is one giant kennel loaded with giant dogs. I can only imagine the poor bloke who had to pick up after the 5000 Mastiffs! Talk about a crappy job. 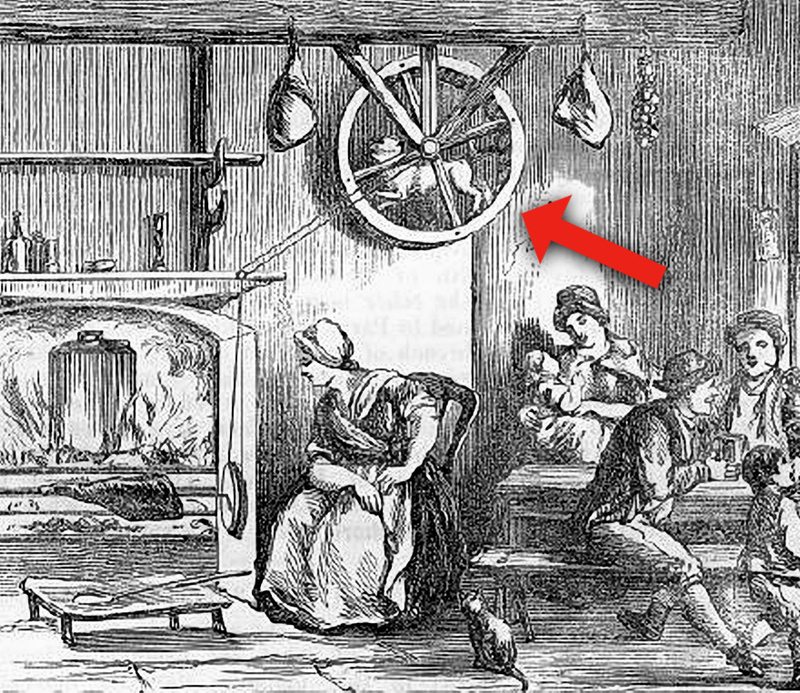 The Turnspit was a working breed of dog with short legs and a long body, so that it would fit inside a wheel by the kitchen fire. The dog would run inside the wheel (imagine a hamster) which turned the roasting spit over the fire so that meat would cook evenly. The Turnspit became extinct around the mid-19th century. Did you know that dogs lack a collarbone? This allows them a greater stride length when running and increased flexibility. The structure of their skeleton gives our dogs the ability to run and jump quickly. Their shoulder bones are not attached to the rest of their skeleton either which aids in greater flexibility and helps when jumping or landing after a jump. Have a great day today and keep learning and exploring our amazing universe and the intricate language of our dogs! As the world turns there is shocking evidence about the slippery state that holds our society together. People’s mental and physical health are suffering. There is an overall lack of self-control. People are allegedly “connected” more through technology and the internet but have less real relationships with those around them. Instant Gratification seems to be the order of the day and this creates major problems in our physical, emotional, mental, and spiritual states of mind that have not been designed to keep these insane break-neck paces that are so common to our society, our work and our family lives. As time keeps on slippin’ slippin’ slippin’ into the future much of mankind and our society is also slippin’ southward in regard to our moral compass, ethics, common courtesy and manners, and overall goodwill and kindness. In fact, crime and danger are common place in cities and suburban neighborhoods across the country and the planet. We hear about crime or see it everyday on the internet, on the news, in the paper, or from a neighbor. My family has been effected by it over the years. I remember many years ago we had a vehicle stolen right outside our house! Another time (many years ago) I was also involved in a road rage incident. Three guys followed me into a parking lot and tried to physically fight with me (all because I honked at them for suddenly cutting me off and almost causing an accident). I fortunately was able to convince them to let me fight only one of them! I was stupid and young at the time. As we started to fight other people saw it and came over and the three buffoons jumped in their car and fled the scene. This Christmas season a package was stolen right off our front porch, which means the low-life had to come through our metal gate and walk through our front yard and up onto our porch to steal it, and we live in a “good” neighborhood! I hate to break it to you, folks, but there are real bad guys that exist and prey on the weak, the unprepared, the innocent and sometimes just random people or homes. Enter the dog. 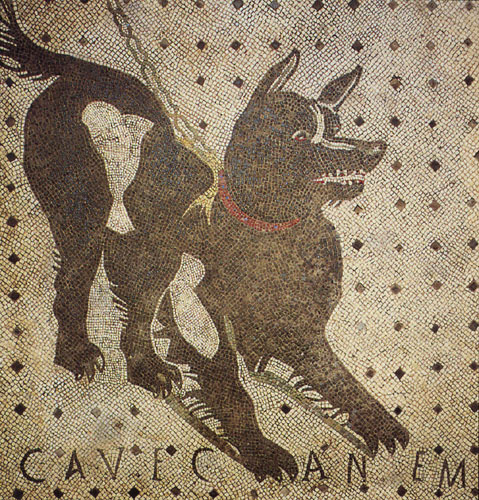 “Cave Canem” is Latin for Beware of Dog. Below is the picture of a 2000 year old Roman floor mosaic from a house in Pompeii, Italy. I love this sign! And love the fact that dogs have been guarding us for years. There are several of these signs found in Italy from ancient times. Dogs are very well known for their fantastic devotion to guarding our home and hearth. As highly intelligent animals many dogs have excellent situational awareness and stay very in tune to their environment and to the family/pack they belong to. A dog’s olfactory sense is much better attuned than us, they hear much better than us (10x’s the tones), see movement (especially in low light) much better than us (due to more rods than cones in the eye), bark much louder than us, run much quicker than us, and bite much, much harder than us! And we all know dogs are more faithful and devoted than most humans. The name “Fido” comes from “Fidelis” meaning, “I am faithful” in Latin. If there’s someone you want in your corner when there is a burglar prowling around your home or a weirdo approaching your wife and kids at the park it isn’t your goldfish…it’s your dog. As animals that are highly intune to their senses there are a multitude of documented cases where dogs have protected and saved their owners or their owners property time and time again. Many dogs almost seem to have a sixth sense about these types of things. There is a great article on Eriesense.com called, “Are you inviting burglars into your home?” It is worth a quick read. They interview former burglars and they give great tips on how you can burglar proof your house. The best tip, and admittedly so by the former burglars, Get a dog! The former burglar is quoted saying, “The single most effective thing you can do is get a dog.” I agree wholeheartedly. Because his little dog barked furiously he saved William from an exceptionally well planned surprise night attack during the Dutch war of independence in 1572. When all his others guards and soldiers failed; William’s dog did not. Here is a shortened list (from Coren’s book) of some of the best dogs for watchdog barking. These breeds will readily bark. Just proceed with caution if you select one of these effective guarding breeds or if you attempt to bring the guarding side out of your dog…most protection trainers would tell you (and I’d agree having done Schutzhund work and some protection training) bringing that side out is pretty easy… calming and calling the dog off is the harder part! Enjoy your dogs, learn to be more aware of your surroundings like your dogs are, and be thankful they are there as an ever present companion and watchdog for your family and your home.